I want to film in Seattle because that’s in keeping with Zioncheck, too. Seattle is a beautiful city, and there’s a lot going on there. The music and the progressive politics are important to this story. And I do not want to come to Seattle and try to overwhelm the city with a film production — I’ll let the city overwhelm the film production. It’s a more creative way to work. It’s a partnership. GRASSROOTS. True story. A short-tempered, unemployed music critic who likes to dress as a polar bear thinks he can harness the power of the people to ride the monorail to political victory in Seattle. And he’s right. Almost. Remember Grant Cogswell? 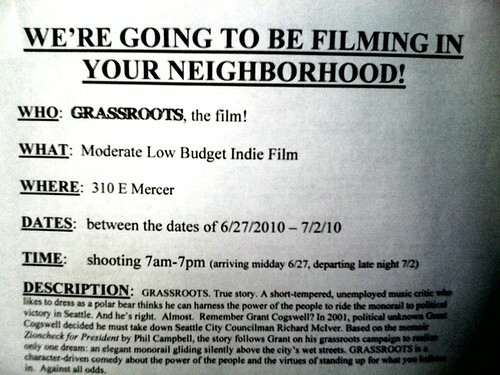 In 2001, political unknown Grant Cogswell decided he must take down Seattle City Councilman Richard McIver. Based on the memoir Zioncheck for President by Phil Campbell, the story follows Grant on his grassroots campaign to realize only one dream: an elegant monorail gliding silently above the city’s wet streets. GRASSROOTS is a character-driven comedy about the power of the people and the virtues of standing up for what you believe in. Against all odds.